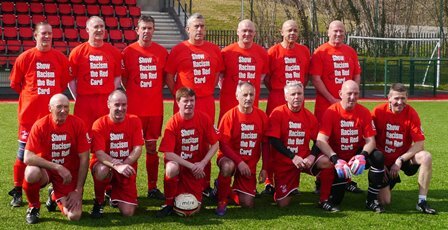 Prior to their match against England Wales Veterans highlighted an anti-racism stance by warming up in Show Racism the Red Card T-shirts and held up red cards side by side with their opposition before kick-off at Ystrad Mynach. Wales came out on top with a 3 - 0 in the Over 55 and also won 1-0 in the Over 50’s match. Wales Veterans will be continuing to support the campaign during their upcoming games both home and abroad. We would like to thank both Wales and England Veterans for showing their support for the campaign and our key messages.